Although a mechanical philosophy of the universe arose in the 17th and 18th centuries due to a necessary physical and spatial exploration, an intuitive organic sensibility remained in the popular imagination. After Charles Darwin published its evolutionary expansion in the mid 19th century, this Romantic view took on the appearance of a temporal gestation. A progressive rise of life, mind, and spirit distinguished the idealist persuasion. But in the 20th century, as John Boodin notes, an expiring cosmos indifferent to human beings has taken over. This pessimism holds today, as John Updike observes in Current Vistas, and lies at the deep root of our secular calamity. These selections glimpse the outlines of a genesis universe from past times. Three lifeworks stand out - the Jesuit paleontologist Pierre Teilhard de Chardin (1881-1955), Russian geochemist Vladimir Vernadsky (1863-1945), and the philosopher Alfred North Whitehead (1861-1947). A significant publication for each is cited as an entry point. The image is from the cover of the Teilhard in the 21st Century book to suggest an innately convergent cosmos that grows in numinous intelligence and community. Al-Farabi Kazakh National University. http://www.kaznu.kz/en/.. We cite this world class institution in Almaty, Kazakhstan for itself and to enter its namesake Abū Naṣr Muḥammad ibn Muḥammad, or popularly Al-Farabi (c. 872-950) a premier Muslim scholar of his day. At the center of the Asian continent, Kazakhstan is the largest landlocked country in the world. In our present electronic global milieu, National University scientists Vladimir Shcherbak and Maxim Makukov can have a paper The “Wow Signal” of the Terrestrial Genetic Code in the journal of solar and cosmic research Icarus (224/1, 2013). This work is also of interest because it is akin to the “Russian Cosmist” tradition, as told by George Young in this section. But it is Al-Farabi whom we want to document as an exemplary Muslin sage. His metaphysical contributions were of such merit that he was paired in his age with Aristotle as “The First and Second Teacher.” Along with legendary mathematicians Avicenna (980-1037), Averroes (1126-1198) and many others, this tradition from central Asia to Andalusia, Spain was the leading philosophical school of these centuries. As these quotes from his Wikipedia posting explain, Al-Farabi praised not only a numinous macrocosm but also the value and import of human life as microcosmic intermediaries. Here then is an Islamic wisdom and heritage that could well be drawn upon a millennium later as its true essence. In contrast to al-Kindi, who considered the subject of metaphysics to be God, al-Farabi believed that it was concerned primarily with being qua being (that is, being in and of itself), and this is related to God only to the extent that God is a principle of absolute being. Al-Kindi's view was, however, a common misconception regarding Greek philosophy amongst Muslim intellectuals at the time, and it was for this reason that Avicenna remarked that he did not understand Aristotle's Metaphysics properly until he had read a prolegomenon written by al-Farabi. Al-Farabi's cosmology is essentially based upon three pillars: Aristotelian metaphysics of causation, highly developed Plotinian emanational cosmology and the Ptolemaic astronomy. In his model, the universe is viewed as a number of concentric circles; the outermost sphere or "first heaven", the sphere of fixed stars, Saturn, Jupiter, Mars, the Sun, Venus, Mercury and finally, the Moon. At the centre of these concentric circles is the sub-lunar realm which contains the material world. Each of these circles represent the domain of the secondary intelligences (symbolized by the celestial bodies themselves), which act as causal intermediaries between the First Cause (in this case, God) and the material world. Albertson, David. Mathematical Theologies. Oxford: Oxford University Press, 2014. A University of Southern California professor of religion recounts the influence of Pythagorean and Platonic numerical theories and more upon Christian philosophies. An emphasis is upon Nicholas of Cusa (1401-1464) and Thierry of Chartes (d. 1150) within a long Greek to modernity train. Our interest is not a historical record but to reflect intimations through time that some sort of informational, structuring program underlies and ordains extant reality. Of course affirming Galileo’s witness of nature as number, it is noted in closing that our 21st computational century quite manifests a homogeneous, mathematical grid stretching from algorithmic genomes to infinite space, a mathesis universalis if there ever was one. Ashworth, William. 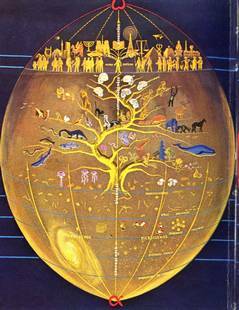 Natural History and the Emblematic World View. David Lindberg and Robert Westman, eds. Reappraisals of the Scientific Revolution. Cambridge: Cambridge University Press, 1990. A University of Missouri historian recounts how the common mindset across Europe until the mid 17th century was the perception of natural, animal, and human domains as resemblances or exemplars of a Divinely imbued image and agency. As a consequence, a sympathy, correlation or emblem served to associate every one and thing. The perennial task was to discern just what language or geometry such a creation is written in. In this medieval age, a doubleness abided of this manifest realm, and an immaterial source. (Of course, the Taoist image of Yin and Yang is the prime Asian version.) It is then noted that with the later advent of mechanical machine model due to Newton, Bacon and many others, a singleness took over which still reigns today. Susan Wise Bauer is a writer, educator, and historian. She has a Ph.D. in American Studies from the College of William & Mary in Virginia, as well as an M.A. in seventeenth-century literature and a Master of Divinity in Ancient Near Eastern Languages and Literature. For fifteen years, she taught literature and composition at the College of William and Mary. A dozen or so works range from cultural histories to classical education at home. Bellucci, Bellucci, Stefano, et al. Black Holes, Gravitational Waves and Space Time Singularities. Foundations of Physics. 48/10, 2018. An introduction to a special issue of papers from a May 2017 workshop at the Vatican Observatory in honor of George Lemaitre (1894-1966), the Belgian priest and cosmologist whom in the 1930s is considered the founder of the big bang origin of the expansive universe. He had a distinguished career at MIT, the Catholic University of America and elsewhere, with a continued importance which drew luminous papers such as Virtual Black Holes and Space-Time Structure by Gerard ‘t Hooft, The Big Bang and its Dark Matter Content by Roger Penrose, On Quantum Life of Black Holes by Gia Dvali (search), The Standard Cosmological Model by George Ellis, and From the Sky to the Fundamental Physics by Renata Kallosh. Ben Jacob, Eshel, et al. Seeking the Foundations of Cognition in Bacteria: From Schrödinger's Negative Entropy to Latent Information. Physica A. 359/495, 2006. In a paper from six years ago that could be called classic since online science moves so fast today, Ben Jacob and Yoash Shapira, Tei Aviv University systems physicists, with Alfred Tauber, Boston University physician and philosopher, turn to microbial colonies as iconic archetypes of “abiotic physical principles of self-organizing complex adaptive systems.” Such dynamical phenomena can then fulfill Erwin Schrodinger’s 1940s prescient theories of life’s innate formative vitality. But to do this requires that a significant distinction be made. In contrast to a “constructivist” view of emergent CAS as just an “accumulation of accidents,” which cannot explain a “natural intelligence,” the authors propose a “global generativism” whence “the foundations of cognition are related to the nested generation of meaning on all levels.” (518) Rather than Turing-like machines in a random reality, living systems avail an informational, evolving guidance that serves to generate and advance the episodic tandem of complexity and consciousness. We reexamine Schrödinger's reflections on the fundamental requirements for life in view of new observations about bacterial self-organization and the emerging understanding of gene-network regulation mechanisms and dynamics. Focusing on the energy, matter and thermodynamic imbalances provided by the environment, Schrödinger proposed his consumption of negative entropy requirement for life. We take the criteria further and propose that, besides “negative entropy”, organisms extract latent information embedded in the complexity of their environment. By latent information we refer to the non-arbitrary spatio-temporal patterns of regularities and variations that characterize the environmental dynamics. Hence it can be used to generate an internal condensed description (model or usable information) of the environment which guides the organisms functioning. Benson, Michael. Cosmigraphics. New York: Abrams, 2014. A writer and producer of graphic books and museum exhibits graces a coffee table with a carefully researched and illustrated scenario of our historical encounter with a planetary abode, starry raiment, and original Divine creation. A notable contrast then arises between past human centuries and the late scientific prowess of a collaborative humankind. For example, Robert Fludd’s 1617 celestial sphere with an earthly center contrasts with a 2013 Planck satellite image of a galactic universe, while Hildegard of Bingen’s 1220 worldly sojourn within numinous heavens is followed by a 2008 satellite view over the North Pole. Into this 21st century what great discovery might be in the offing if only we could ask and imagine? Bergson, Henri. Creative Evolution. New York: Henry Holt, 1911. The premier work of the French philosopher and one of the best exemplars in its day of life's teleological procession of body, brain, mind, morality, and spirit. Bergson's writings were a vital resource for Teilhard de Chardin's later elaboration. Berry, Thomas. The Dream of the Earth. San Francisco: Sierra Club Books, 1988. Sage essays contemplate the epic proportions and responsibilities of the human presence in an immense, still unfolding numinous universe. Typical chapter titles are: The Earth Community, The Ecological Age, Bioregions: The Context for Reinhabiting the Earth, The Historical Role of the American Indian and The Cosmology of Peace. Boodin, John. Cosmic Evolution. New York: Macmillan, 1925. In a good example of this persuasion from the early 20th century, a philosopher outlines a “cosmic idealism” to express the progressive rise of life, mind and spirit. This optimism is contrasted with a sterile materialism then taking over, of which Bertrand Russell was a prime advocate. Some 80 years later the moribund model still reigns, but the project that Boodin and others pursued may at last come to fruition, with enough pieces in place, within its humankind vista.